Michael Shermer is an intelligent and experienced writer when it comes to all things science. He is not only a writer, but also a science historian, but most of all, a skeptic. Skeptics are defined as ones who question, or have a questioning attitude toward, knowledge facts, or any opinion stated as fact. Science skeptics are just that: skeptics of things related to science. Michael Shermer is the chief editor of Skeptic magazine, a publication focusing on refuting pseudoscience and uncovering the truths behind fakers, quacks, and illusionists, or those who just don't have their facts straight. He is also the founder of the Skeptics Society. He has also been writing for Scientific American, with his own "skeptic" column. 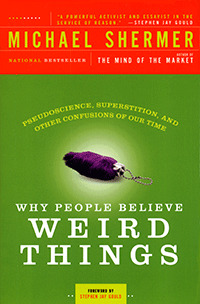 Why People Believe Weird Things is a great read. In the beginning of the book, Shermer talks about his own beliefs. He was raised as a Fundamentalist Christian Baptist, but began questioning his own beliefs in college. He first converted to Deism, which focuses on straying away from organized religion. Deists believe that you only need to focus on nature and the natural world to determine that a higher creator made our universe. He then became interested in New Age Mysticism. The New Age movement focused on joining Eastern and Western spiritualities, combined with psychology, parapsychology, physics, and holistic health/healing. In the second part of the book, Shermer focuses on thinking on a paranormal level. He talks of the stereotypical person who believes paranormal facts, and other pseudoscientific knowledge. He points out that they are quick to believe facts that promote their own opinions and expectations, yet, refute or choose not research any information that goes against what they believe in, concerning specific pseudoscientific information. He goes into talking about why people believe things without hard evidence, which we talked about in lecture. Part three of the book didn't really hold my interest too well, and I didn't think it pertained to the class as much as the first two parts. He mostly talked about creationist theories and claims; 25 to be exact. He listed each one consecutively, and tried to refute the claims with his own evidence and research. In part four, Shermer talks of Holocaust deniers and how, like pseudo/paranormal believers, they reject proven fact. This is the main problem as to why paranormal and pseudoscientific myths still exist. It can even happen with more serious events, which are actual true and factual, because of the same principles regarding things that are fake. In part five, Shermer closes with some hard-hitting information. He claims that intelligent people are most susceptible to believing things that aren't true. He states that smart persons deceive themselves because their ego is as large as their intelligence. He explores people of this description, claiming that many scholars and respected scientists and dignitaries ruin their careers by changing their research concentration from a mainstream science, and focus on something paranormal or something of the pseudosciences, and completely destroy lifetimes of work, and also lose their respect from the scientific community. Most ruin their own lives. Aside from the third chapter, though I didn't hate it completely, I really enjoyed the book. Why People Believe Weird Things insightful as it was interesting. Shermer made a lot of valid points, and I really appreciate what he does for the scientific community. Not many people want to even acknowledge some of the claims that these whack-jobs try to pass off as real information. I feel that someone needs to do so, so we can get back to real science. At the time, this was a brilliant plan. It saved lots of money and space. The size of these machines, as well as the cost of the disks themselves, had businesses concerned. So, a simple solution would almost triple the capacity of their hard disk drives. In the 1980's, certain people began mentioning that it could be a problem. At that time even, computers ruled the world. 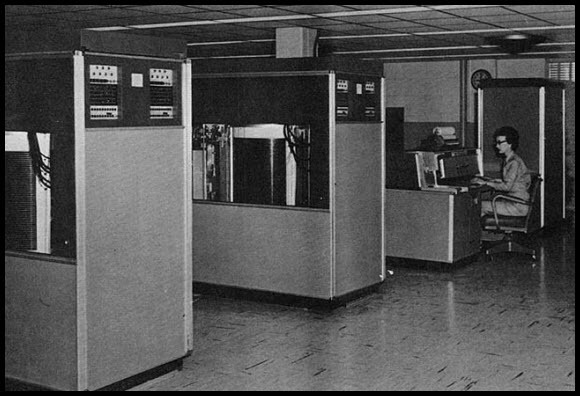 Credit card machines, Airports, Military technology, and many more things located in the United States of America, and other thriving countries, were run by computer technology for the most part. Scientists and Theorists began to wonder and speculate about whether or not computers would be confused and/or bugs would occur and ruin hard drives and deactivate computer systems across the globe when the new millennium changed in the year 2000. It wasn't a serious issue at the time, around 1986, when articles pertaining to this nature began sprouting up in journals, magazines, and newspapers. Articles were few and far between. In the year 1999, after the topic lay mostly dormant for 15 years or so, concern of an even larger capacity began to form amongst the general public. After all, 15 years in the computer business is a long time. Technology moves fast in silicon valley. By 1999, computers were so efficient, that everyone used them, even in their own homes. Computers were even found in 2nd world countries. I wouldn't say people were worried. I knew I wasn't. I had much more faith in mankind. I didn't think we were about to let something we created and built destroy us that easily. Rumors of planes and space satellites were doomed to come crashing to the Earth's surface. Trains would run rampant off of their tracks at incredible speeds. Traffic lights all over the world would cease to work any longer. Naturally, mankind won. New operating systems and software made it a simple task to convert files to a 4-digit date format. Time and money were saved, as well as our lives, hypothetically. Many companies waited until after January 1, 2000 to change over the formats on their hard drives, which were now much smaller, and could store unimaginable amounts of data compared to their 1960's counterparts. Ritalin Nation perfectly explains the non-existing ADHD epidemic and how its’ attention has grown over the past few decades. It is written by someone who holds a Ph.D. so it can be assumed that all the information in the book is well researched. The first three chapters explain how culture has hurried our society into a frenzy. With the rapidly growing rate of technology, everyone expects things to be faster including life itself. Cars, computers, and on-demand television all can perform faster than in the past. You could say that the advancement of technology has spoiled us a little bit. We now expect everything to be at our fingertips as soon as we want it. Most people can’t sit in a lecture without wishing they had a remote to fast forward through the boring parts. This hurried way of life has made us all impatient, but that doesn’t mean that we all have developed ADHD or ADD. The next two chapters talked about how unnecessarily quick everyone is to diagnose themselves with a problem. Many people who had been diagnosed with multiple chemical sensitivity (MCS) have had reactions to placebos. That makes the illness more of a psychological one than a physiological one. ADD is not an illness by itself. It is actually just a name for a collection of symptoms that describe inattention. If a person has maybe 3 symptoms out of the list they are very quick to assume the diagnosis of ADD. Once seeing the other symptoms, they are also quick to start interpreting most of their actions as portraying ADD even if they didn’t notice a problem before. Since it is considered a psychological illness it is very hard to correctly diagnose and efficiently treat it. My favorite part was the topic of time that parents spend with their children. Some parents choose quality time over quantity of time or vice versa. It says “hurried, unstructured lives children are living in today connect to the rise of sensory addictions.” The parents choosing quality time may not be choosing the best choice for their children. A loss of family structure such as a routine or attention from parents results in the child developing a loss of self-control or self-organization. Without attention from families, children resort to being entertained by things like television, video games, and other speedy activities. They are no longer able to appreciate slower moving activities such as reading. They easily lose their concentration and self-control. A school teacher said that she used to be able to start teaching right away, but now when children come in the morning she has to spend a transition period to grab their attention. Parenting style ultimately affects the response of a child’s sensory. I would like to make an association with children’s attention problems and the effort to connect learning styles to each child. Learning styles have developed as a method to make sure each child absorbs the most information they can in the most efficient way. It’s very unpractical while teaching a group of children with all different styles. It has also been proven useless. I think some teachers and parents still attempt to determine and use learning styles because they are left with no other avenue. Their children have severe depletion of attention. Some people are born with more patience than others, but mostly everyone has the same attention span capabilities. I believe that it is a result of the upbringing and environment children are living in that hinder their learning abilities. Learning styles are just an excuse like ADD is an excuse. Who doesn’t have these experiences all the time? It’s a normal occurrence in everyone. It doesn’t produce a diagnosis for ADHD. The quiz is not a scientific method of determining ADHD and it advises that if you have a significant score than you should visit a mental health professional. If you would like to take the quiz here is the link: http://psychcentral.com/addquiz.htm. However, if you don’t have enough attention span for the entire quiz, here is the link to a six question one: http://psychcentral.com/quizzes/adultaddquiz.htm. I do suggest, that if you don’t even have enough patience for a short quiz and need it shortened even more, than you might as well go see a professional right now. Reading this book makes me realize that paying attention to children and preserving their appreciation for the relaxing slowness of time is very important. I will make sure my quality time spent with my children is more than just enjoying a movie. ADD in small forms could easily be preventable with a little patience. I also learned to not jump to conclusions. A few symptoms don’t mean a diagnosis or even a physical problem. Some things are made in your mind and can be changed the same way it was created. 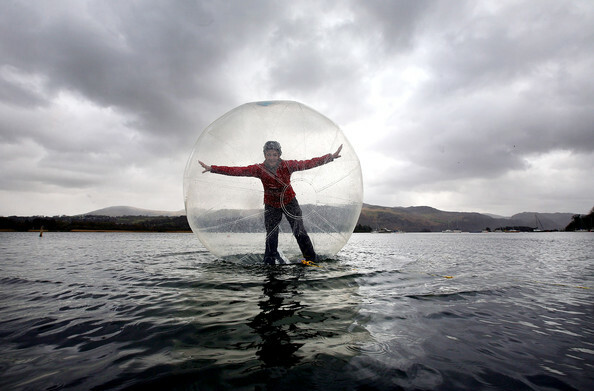 Bordem isn’t a disease, and were certainly not in a recession of entertainment. Everyday something new is created and we have a world full of things to enjoy. We just need to have the self-control to be able to find something, be patient with it, and enjoy it. In Ritalin Nation, Dr. Richard DeGrandpre delves into "America's obsession with performance and quick satisfaction and the country's reliance on Ritalin as a performance-enhancing drug". This book literally explained the common denominator as to why parents feel that their children need to be on this drug and what it does to improve the everyday lives of their children. Ritalin, which is a psychostimulant, helps with the epidemic of attention deficit disorder or ADD. Throughout this book, Dr. DeGrandpre expresses how he feels that this obsession may be hurting the kids in this country, by not actually looking into the symptoms of what truly is part of ADD and what people want to believe can be part of it. The book gave great insight and it is truly amazing to think of all the stuff parents will do to get this drug for their children because they feel it will help them throughout their school time and lives. All these claims seem to be backed up by a bunch of pseudoscience. In chapter 6.1 of our book, research has found that “[The assumption that one can improve instruction by matching materials to children’s modality strengths] appears to lack even minimal empirical support.” Modality refers to vision and hearing sensations. Even teachers who have attended learning styles workshops have said they stopped trying to match children by their learning styles. However, many people still believe that learning styles can improve performance. The Huntington Learning Center is where children who are behind in school can go to get tutoring. They believe that determining learning styles are very important for the success of children. Here is their description of learning styles and if you click on the link it will bring you to a page where you could determine your child’s learning style. Although I don’t know how well I feel about sending my child to a tutoring center where they use instructions supported by pseudoscience.